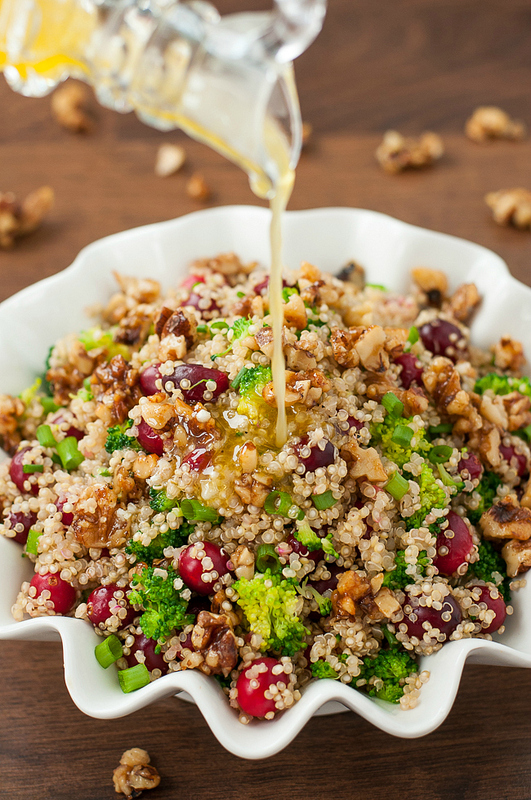 We’re in love with this healthy gluten-free Cranberry Quinoa Salad with Candied Walnuts! While I love a good bowl full of Summer, festive Fall salads have a special place in my heart and, quite frankly, my stomach! I’m thinking it’s the change of pace that gets me all riled up. By the end of summer I’m so positively over salads that I eye-roll at the thought of having one for anything other than a side dish to a more exciting main course. Of course those last few weeks of Winter leave me craving a fresh cucumber salad so badly I might die. If you’ve been reading long enough you’re probably used to my end-of-season whine fest and how quickly I throw myself into the next season out of sheer exasperation over the last. I’m a sucker for tradition. Now that it’s fall all I want are my favorite comfort foods! Of course I still want salads too… There’s also the fact that I need to get creative if I want to partake in the holiday cookie chomping spree that happens ever year, and that means throwing some lightened up fare into the mix. Now I know you kids are still cuckoo for pumpkin puffs, but I’m all about that bass those cranberries. and I’m allllllll about those candied walnuts! I’ll never shell out (hah!) for pricey candied nuts again. It’s far to easy to make them fresh AND I get to crack (ha ha!) cheesy nut jokes while I make them. It’s a win-win situation of nutty proportions. Now I’m going to go hide under the bed until I learn how to behave myself. That… may take a while. You should make this salad to help pass the time. 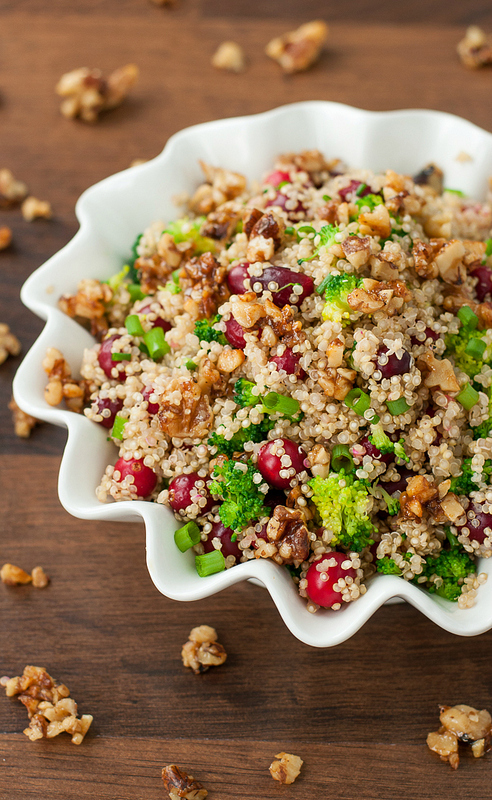 We’re head over heels for this tasty cranberry quinoa salad! 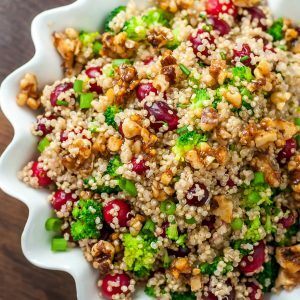 This tasty cranberry quinoa salad is packed with juicy cranberries, vibrant veggies, and homemade candied walnuts! Next add your broth and bring pot to a boil. If you're using frozen cranberries, add them to the pot after 6-8 minutes; if you're using dried or fresh cranberries add them in around the 9-10 minute mark and recover. Test the cranberries before pulling from heat to make sure they've had enough time to cook, then remove from heat. Once your quinoa and cranberries are done, season with a teeny bit of salt and pepper, fluff gently with a fork, and set aside. While your quinoa cools, add a little water to that same pot and bring to a boil. Gently blanch your broccoli florets until bright green and al-dente (you want it to still be a bit firm yet tender, not mushy) which should only take a few minutes. Drain, chop into bite-sized bits, and add to the quinoa along with chopped green onion. Place quinoa in the fridge while you prep your dressing and walnuts. DRESSING: Smash and mince garlic into a paste and combine with all remaining dressing ingredients. Whisk well and set aside. CANDIED WALNUTS: Heat a skillet or saucepan to medium heat and butter to melt. Next add in your chopped walnuts, honey, salt, and sugar. Saute for 5-6 minutes and pour over parchment paper, using a spatula to separate the nuts. Otherwise you'll have yummy walnut brittle that you'll want to break apart over your salad, which is no big deal either! Yum! Allow to cool for several minutes until the coating hardens and your walnuts have officially been candied! Woot! Try not to eat them all before they hit the salad. Grab your bowl-o-quinoa and top with the walnuts. Drizzle with dressing just before digging in! Serve this up as a salad for lunch [I ate the entire thing myself, ha! It can easily serve 2 if needed] or serve it up as a colorful side dish to stretch it to 4 servings. Serve it chilled or at room temperature, it's great both ways! Enjoy! Recipe yields 6 side dish sized servings or 2-3 large portions. If you're using fresh berries, the dish will have an extra burst of tartness that those juicy little buggers are infamous for! For those of you who find cranberries to be super tart when served straight up, grab a bag of dried cranberries. They're sweeter and still deliver amazing flavor to this dish! Both will result in some serious deliciousness! Vegan? Skip the honey and substitute with extra brown sugar. Nutrition facts for the salad and dressing are an estimate provided by an online nutrition calculator. Adjust as needed when adding candied walnuts, which are usually an extra 130 calories per serving. To whip up a vegan-friendly version of this salad, simply skip the honey in the candied walnuts and use a little extra sugar or maple syrup instead! For the butter you can use your choice of earth balance or coconut oil, whatever your favorite sub is. Feel free to add some chopped or shredded chicken to this salad. It also makes a great use for thanksgiving leftovers, so save a little turkey and use it to make this! Whatever you do, make this salad! In other news, I wanted to DRINK this dressing! I stole a spoonful while I was taste testing and might have dove back in for seconds or thirds. The combination of juicy lime and orange juice with the subtly fruity undertones of the olive oil and the punch of raw garlic? I just love it. You should probably go ahead and double the recipe so you can pour it on your veggies all week long. Assuming you don’t indeed drink it. I won’t tell if you do, pinky promise. Actually, while you’re at it, you may want to double the recipe for the walnuts too. If you’re anything like me you’ll start shoving them in your face the second they’re cool enough to handle. Or while they’re still molten… We live life dangerously around here. 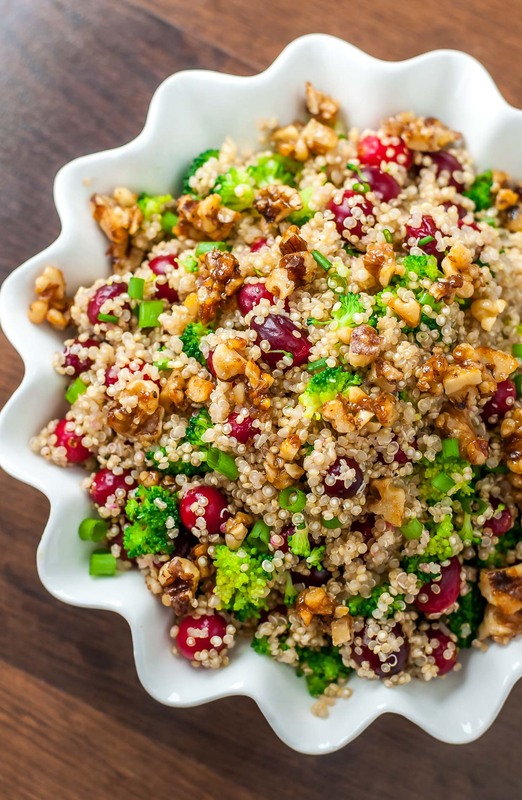 If you get a chance to try this Cranberry Quinoa Salad, let me know! Hey – Great recipe! We have made it several times. One clarification you could make: You say if you are using fresh or frozen cranberries, add them “after 6-8 minutes”, but if using dried, add them “at the 9-10 minute mark.” That second one is a tad ambiguous – should I add them *after* 9-10 minutes or with 9-10 minutes *left* on the timer? I brought this as a hearty side dish for vegetarians at Thanksgiving and it was so perfect! Delicious. I’m making it again and I have some extra celery hanging out in the refrigerator. Have you ever added celery, or do you think it would mess with the flavors too much? I didn’t have any broccoli so I added green apples and red bell pepper. It was really tasty! Thanks for the recipe. Was pretty good. Really liked all the ingredients. Wish it was tad sweeter, maybe in the dressing. Tasted a little plain, maybe after it cools it will have a chance to marinade. My boyfriend liked it and he’s not into healthy foods. Tried the Quinoa Cranberry Salad – made it for a charity committee luncheon. It was a big hit. Thanks. This was a delicious recipe. It’s unfortunate that it was taken down on Pinterest. That’s such an easy way to save recipes for later! ah, I thought it seemed strange that any blogger would want to minimize traffic to their blog. good to know it wasn’t you. I originally found the post on pinterest and repinned it so I pinned again directly from your site. I can’t wait to try more of your recipes! Thank you Joy! 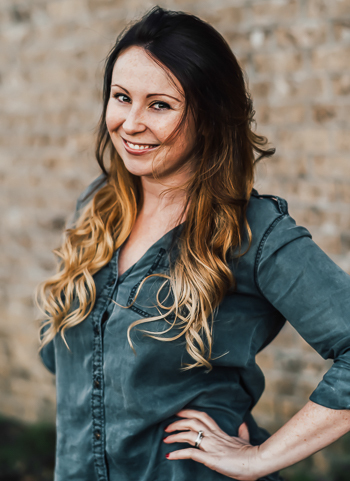 Your support means the world to me! 🙂 Totally keep me posted on what you try next! This looks really good. Do you have any info to help with serving size and calories per serving? Absolutely Debbie! 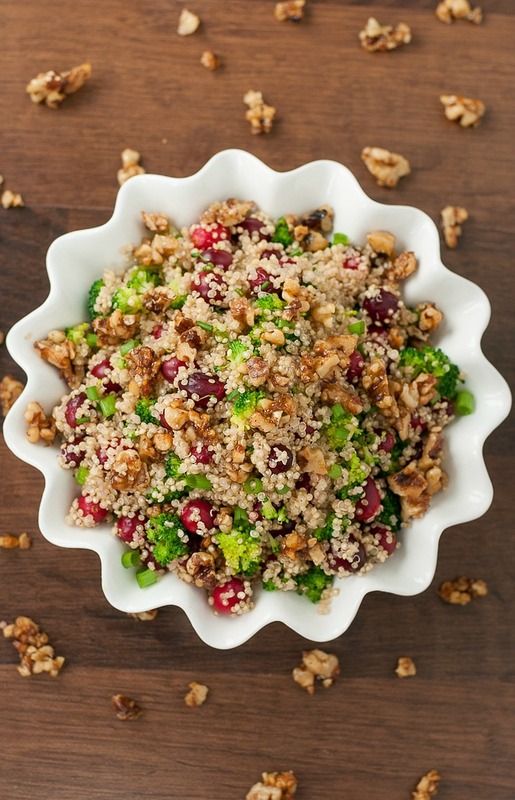 This recipe yields 6 side-dish sized servings of quinoa salad. Question re the ratio of liquid to quinoa…most other directions for cooking quinoa use more liquid (broth)? Any idea how many calories? I made mine with just plain walnuts. Also as side note, once quino was done, I dumped all into pot and mixed. Turned out great!! This recipe sounds amazing but a couple of my guests have nut allergies. Would there be a substitute for walnuts. Maybe pinenuts. Apples and pears? I can’t think of anything that can be candied. I am always looking for new ways to cook quinoa as it is so packed with nutrients. This looks amazing AND gluten free! Thanks for adding the vegan substitutes as well. This dish works for just about anyone! Love it! Made it tonight and paired with sweet potatoes for my 4-year-old and I, and a regular baked potato for my husband. Thanks, this is going on my keep it board! Beautiful red and green combination! And I’m always up for candied walnuts. I stock up on cranberries in the fall and freeze them for uses like this. Hey Leora! Shredded raw brussel sprouts (I like to grate them on the coarse side of a cheese grater or chop them up so they resemble shredded lettuce) will work great if you have any handy. If you’re low on veggies you can make it without and it’ll still taste great! I’d honestly try it with the frozen broccoli – just steam/cook it so it’s your perfect degree of tenderness and serve it on the side… this way you can mix as much as you want into the salad 🙂 Hello longest ramble ever! Hope that helps! Hi! Where I live I cannot find cranberries. Can you recommend another berry? Hi Paola! Do they sell dried cranberries or “craisins” near you? Those are great in this salad! Golden or regular raisins would actually work too if you’re a fan of them. Chopped apple would probably be fabulous too! Made this tonight over a bed of chopped Romaine lettuce and added a grilled tuna steak. INSANE. this salad was delicious! Night and refreshing with the perfect sweet crunch! My family loved it! Even the 2 year old!! Just prepping it now for our Christmas dinner. Will keep cooked quinoa, veggies, nuts and dressing separate until shortly before serving. Thanks for the recipe! Looks awesome!!! Made this as a side for Thanksgiving yesterday. A hit with everyone! Does anyone know how many servings I get out of this recipe? Absolutely! Hope you love it!!!! I would save the dressing and walnuts for just before serving and you’re good to go! =) Happy Thanksgiving Jamie! This salad sounds amazing. I’m wondering how many people this recipe would feed, as I would love to try this for Thanksgiving. Also you crack. me. up! I’m sorry but I’m totally making the candied walnuts by the tonne. The salad looks good but tHE CANDIED WALNUTS. oh my girl! This is a must make for Thanksgiving! pinned for later! this looks like the perfect side dish for the fall! It would be one baller side for all that yummy food! mmmm I love greek quinoa too! Hope you add this one to the rotation as well! I made roasted candied almonds last night because candied nuts, duh. Amazing. This salad is beautiful and perhaps the perfect Thanksgiving side dish to shake things up. Thanks. You’re the bomb. This says protein packed-crunchiness all around! Ok seriously. I love candied nuts. But I NEVER buy them because I stuff my face until they’re gone. But they look pretty easy to make!! They’re SO easy! This way you can make a small batch and save money!